Zylofone Media, through their Communications Director Samuel A. Baah have issued what they call a ‘clarification’ about the interpretation of Zylofone Media CEO’s tweet by the general public. 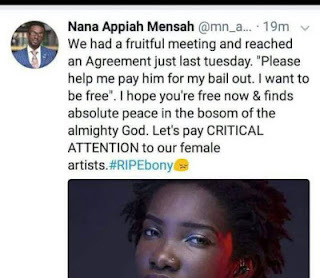 The CEO of Zylofon Media, Nana Appiah Mensah, in the said tweet, alleged that Ebony pleaded with him to pay her Manager off in order to ‘free’ her from him, that is Bullet of Ruff Town Records. According to him, he had met up with Ebony and had agreed on terms of contract with the beautiful and super-talented Dancehall Songstress and was almost on the verge of signing her until her demise. 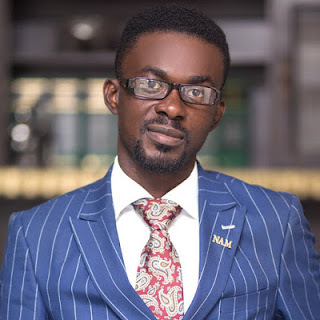 Nana Appiah Mensah CEO of Zylophone disclosed all these on Twitter while eulogising the artiste: “We had a fruitful meeting and reached an Agreement just last Tuesday. “Please help me pay him for my bail out. I want to be free”. I hope you’re free now & finds absolute peace in the bosom of the almighty God. Let’s pay CRITICAL ATTENTION to our female artists”, the tweet from the big time Showbiz mogul said.